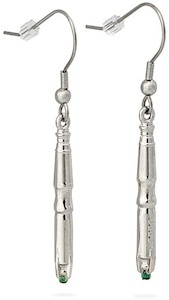 I think Clara needs some nice earrings and maybe these Tardis earrings would be perfect for her. 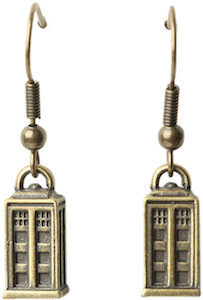 Of course any Doctor Who fan can get these burnished gold earrings and just look special. These are charm earrings so they will nicely dangle on your ears and every time you feel them move you can think about the Doctor and hope that one day you can be the companion. A Doctor Who fan of course would like to have a special pair of earrings in their jewelry box and I think that these earrings would be great.